If I'd known what we were getting into with White Hut, I might have avoided the place - and that would have meant missing out on seeing it in its element. 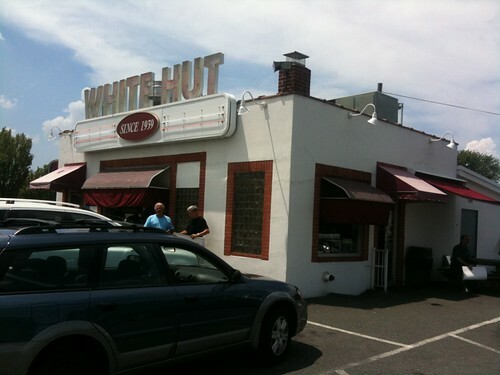 White Hut is a small little burger-and-hot-dog joint in Springfield, Massachusetts. What this picture does not show is that when we drove up, there were TV crews in the parking lot. TV crews are a potentially bad sign for Roadfooding - not as bad a sign as SWAT teams or hazmat suits, but still something to be wary about. Inside, we discovered that White Hut was hosting a campaign rally for this tall gubernatorial candidate. The place was utter bedlam; you couldn't even get close to the counter without discreet elbow work. 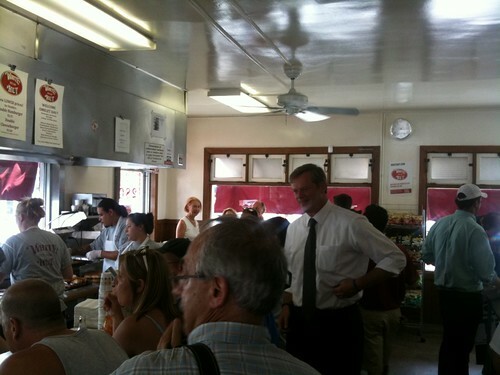 The candidate shook my hand and said, "Hi, I'm Charlie Baker, and I'm running for governor." I'm not very interested in Massachusetts politics, so I tried to give him permission to talk to someone else: "Hi, I'm Ralph Melton, and I'm from Pennsylvania." I will say this for him: he didn't drop me right away. He said something innocuous like "We've got a lot of people from out of state today. It's great to see you here!" I have no idea of his policies or whether he'll do the right thing for Pennsylvania (or Massachusetts), but I approve of his schmoozing; I have stories of us being treated far worse by professional schmoozers. But here's how that reflects well on White Hut: despite this teeming throng of people, the White Hut staff handled things quickly and efficiently. I had to shout my order to a staffperson across two rows of customers, but in just a minute or two, we got handed a bag with a perfectly completed order, down to the condiments. I've seen fast food chains collapse into commercial hysteria with half such a horde, but White Hut seemed to handle such a frenetic crowd with aplomb. I was very impressed. Nevertheless, we chose to eat at the tables outside where there was a chance of hearing ourselves think. We split a burger and two hot dogs. 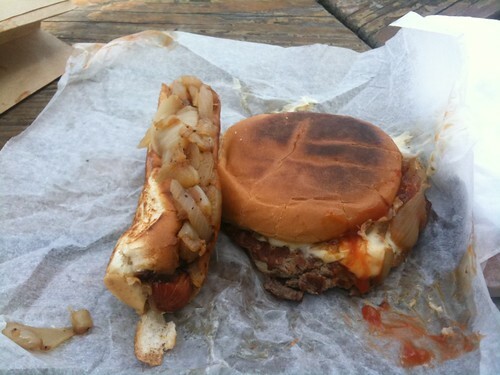 Both burger and dog were tasty in a juicy, messy way, with a whole lot of grilled onions.